Bring your friends, family and colleagues to come learn the latest facts and figures, and how to get involved in the fight against Alzheimer’s disease by joining our 2016 Walk as a Team Captain! Together we will walk toward the ultimate finish line – the end of Alzheimer’s. 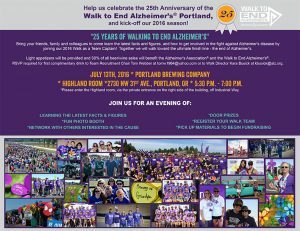 Light appetizers will be provided and 30% of all beer/wine sales will benefit the Alzheimer’s Association® and the Walk to End Alzheimer’s®. RSVP required for first complimentary drink to Team Recruitment Chair Tom Webber at tomw1964@yahoo.com or to Walk Director Kara Busick at kbusick@alz.org.